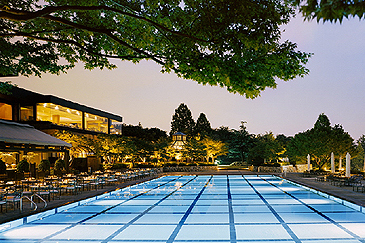 Grand Hyatt Seoul's acclaimed Poolside BBQ opens its grills for the season once again starting Friday, May 11, 2007. The city's favourite outdoor dining spot provides diners with a romantic setting, overlooking sparkling blue waters, scenic gardens and breathtaking night views of the city. Experience the Poolside Barbeque's daily catch of ocean fresh seafood and selection o! f prime meats and sausages, charcoal grilled to perfection. But that's not all. The barbeque also offers a showcase of salads, side dishes and decadent desserts, perfectly complementing all of the grilled entrées. The buffet is open daily, weather permitting, from 6:00pm to 10:00pm and the price is KRW52,000 for adults and KRW29,000 for children, exclusive of tax and service charge. Come to the Poolside Barbeque for an evening of fulfillment for both the eyes and the appetite.